One of the top questions cruisers ask about their ports on a Caribbean cruise is “where’s the nearest beach?”. After all, you chose to cruise to paradise for a reason! With only 32 square miles of island, the great news about St. Thomas is that almost every beach on the island is just a short ride away, and with so many islands nearby, you can explore beaches in St. John or beach hop in the British Virgin Islands, even on a cruise ship schedule! As your personal local guide, I’m here to answer all your questions on the St Thomas beaches near cruise port from how to get to the best beach to the top St Thomas beachside excursions. I also know that you may be concerned about the effects of Hurricanes Irma and Maria so I have made a little update to this guide to let you know if the Department of Public Natural Resources has given the go ahead for safety while swimming. Let’s hit the beach! Enjoy a direct ride to the St Thomas beach of your choice with the CaribbaConnect Private Express Transportation! 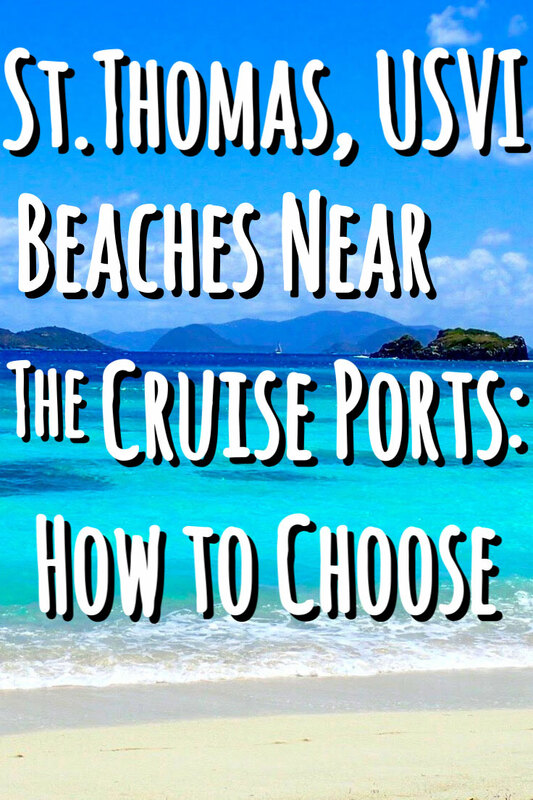 What’s the closest beach to St Thomas cruise port? St. Thomas has two cruise ports: Crown Bay and Havensight. The two ports are not near each other, so you will first need to find out which dock your ship will be in. Searching for the simplest way to hit the beaches right from your cruise port? 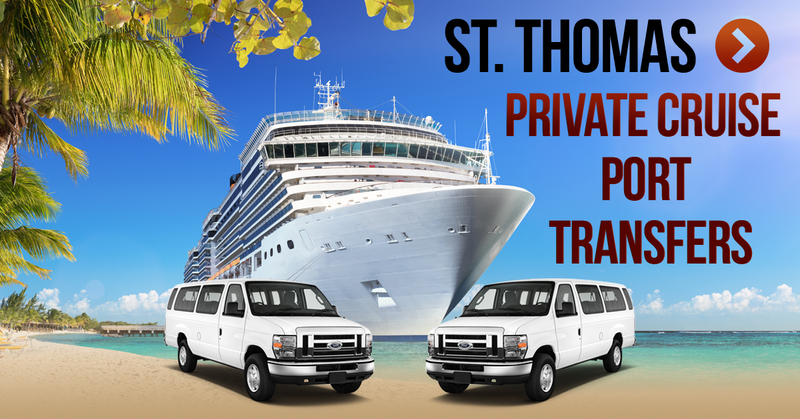 A pre-booked Private St Thomas Cruise Port Taxi includes a private vehicle, personal driver, and a destination of your choice so you and your entire group can hit any of the beaches you want on your day in port! If you’re looking for a quick trip, these beaches are the closest ones to the cruise docks. 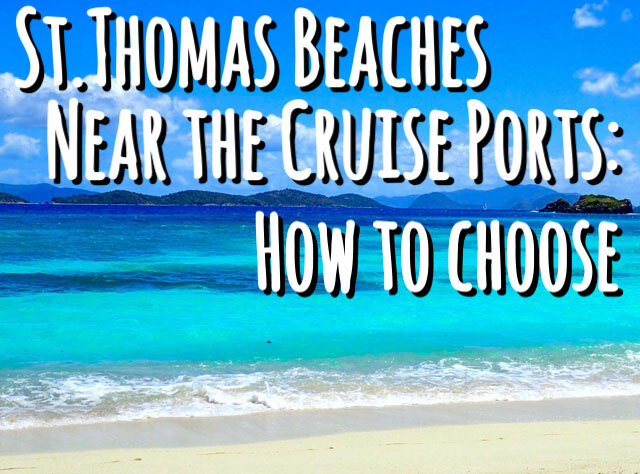 Note that even the St Thomas beaches close to cruise port are not in walking distance from either dock, but these beautiful beaches will be your shortest taxi ride (less than 30 minutes) to a day of fun in the sun. Brewers Bay- one of the longer beaches in St. Thomas with unique views of planes landing at nearby Cyril E. King airport. Brewers features soft sand and good snorkeling with stingrays and conch known to frequent the bay. This beach is also equipped with local food trucks, facilities, and a lifeguard on duty. *This beach PASSED the DPNR water quality standards for swimming on their February 19 - February 22, 2019 survey. Lindbergh Bay- a turquoise hotel-front beach that welcomes the public with two oceanside restaurants. Lindbergh features all the facilities you need for a day at the beach along with watersport and beach chair rentals. *This beach DID NOT PASS the DPNR water quality standards for swimming on their February 19 - February 22, 2019 survey. Morningstar Beach- located at the Marriott Frenchmans Reef and Morning Star Beach Resort. Morningstar is a long, white sand beach. It was the setting of the Marriott Morningstar Beach Resort prior to Hurricanes Irma and Maria. The Marriott is currently closed for business due to the aftermath of the storms. Where are the best beaches in St Thomas near cruise port? St. Thomas is home to over 40 breathtaking beaches, but some stand out among the crowd. While you can taxi to any one of these beaches in under 30 minutes, the best way to hit the top beaches in St. Thomas is with an island tour. Get to know the real St. Thomas in all its splendor from amazing island views to unique culture before you head over to Coki Point for an afternoon of snorkeling with an Island Tour with Beach stop in St Thomas. Score tax free and duty free deals on jewelry of all kinds, top shelf liquor, and more as you hit the shops and see the sights before heading to famous Magens Bay St Thomas from Cruise Port on an Island Tour with Shopping and Beach Stop in St Thomas. Can’t pick just one? Experience all the best beaches and all the best views in St. Thomas with a 4.5 Hour Private Tour with Custom Itinerary on your day in port! No matter how you choose to see them, a top St. Thomas beach should be at the top of your list! Magens Bay- the most famous beach in St. Thomas and known as one of the top beaches in the world! Magens is the largest beach in St. Thomas at 1 mile long. This beach features: an oceanside restaurant, bar, shops, beach chair and watersport rentals, facilities, picnic benches, pavilion rentals, and lifeguards on duty. You’ll have everything you need for a full day of sun and fun at Magens Bay! If you take an island tour to Magens, you’ll get the bonus of a world class view from Drake’s Seat where you’ll snap postcard perfect pics of Magens Bay and nearby islands! Coki Point- best known for its awesome snorkeling, Coki has an abundance of tropical fish! Beach vendors even sell fish food, so they’ll eat right out of your hand! Try out some watersports or rent a beach chair and sip on a fresh cocktail. Coki Beach is fully equipped for a full day of fun at the beach with facilities, lifeguards, shops, and restaurants offering beachside service. Why not try diving while you’re out at the beach? 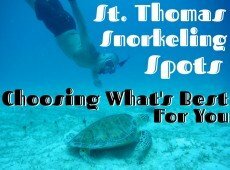 With a Discover Scuba Diving in St. Thomas excursion, you can get the best of St. Thomas beaches from above and below the sea without any certification! Certified divers can get up close with the fantastic reefs that Coki Beach is famous for on a Coki Beach Scuba Dive in St. Thomas, and the best part is, there’s still plenty of time to soak up some sun and some delicious local rum before heading back to your ship. Sapphire Beach- named for its bright blue, sapphire waters, you’ll find amazing ocean views and snorkeling spots at this villa-front beach! Sapphire also offers beachside food and beverage service, rentals, and facilities. Snorkel among the thriving coral reefs and look out for spotted eagle rays. Explore the picture perfect rocky shore where weddings are held or take some time to feed the ducks. Looking for a thrilling excursion to go with your beach day? Soar over St. Thomas and take in island views from spectacular heights as you parachute over the crystal Caribbean Sea on a Parasailing in St Thomas excursion! Experience the biggest thrill in St. Thomas and the brightest blue waters at Sapphire Beach. Lindquist (Smith Bay Park)- with soft white sand and down-island views, Lindquist isone of the most pristine beaches in St. Thomas near cruise port! This untouched beach is equipped with facilities, picnic tables, and pavilions for rent. Lay out a towel, capture the views, and let the sounds of the waves take all your troubles away! Secret Harbor- located at Secret Harbour Beach Resort St Thomas, this beach welcomes cruise shippers and island tours. Secret Harbor features great beachside restaurants, beach chair and watersport rentals and facilities. It’s also known for great snorkeling spots and lots of fish just off the beach- perfect for kids and beginners! Are there any hotel beaches near St Thomas cruise port? 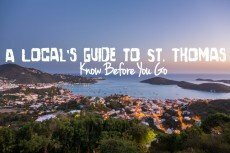 Falling in love with St Thomas before you even arrive? Trust me, I get it! Start planning your long term visit to the island with a stop at a hotel beach to scope out a great place to stay. As you will appreciate when you’re their guest, many hotel beaches offer amenities such as beach chairs and beachside services exclusively for their guests, but some may offer rentals if you want the full guest experience. All beaches in the USVI are public, so you are always welcome to lay out with your towel and partake in the beachside bar! Sugar Bay- located at Sugar Bay Resort and Spa. *This beach WAS NOT PART OF THE DPNR SURVEY for swimming on their February 19 - February 22, 2019 survey. *This beach WAS NOT PART OF THE DPNR SURVEY for swimming on their February 19 – February 22, 2019 survey. Can I visit St. John or BVI beaches from the St Thomas cruise port? Absolutely! 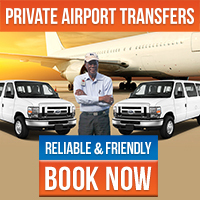 If you’re looking to go over to St. John, taxi service from your cruise port will bring you to the Red Hook Ferry Terminal where the Ferry to St John from St Thomas leave severy hour on the hour to and from St. John. From the St. John ferry, you can taxi to the top beaches in St. John. Feeling adventurous? Hike the National Park Trail (or take a taxi) and enjoy a full day of watersports and relaxation at one of the top beaches in the USVI with a Honeymoon Beach All-Day Watersports Package! If your ship is in for a full day, why not add some time in the British Virgin Islands with a stop at famous White Bay in Jost Van Dyke? Customize a full day on the water with beach and snorkeling stops in the US and BVI on a Full Day 35ft Powerboat Rental. Whether you’re parasailing from Sapphire Beach or taking an island tour from the St Thomas cruise port to Magens Bay, you will feel like you’ve truly found paradise at St. Thomas beaches! So free up your camera space, pack plenty of sunscreen, and get ready for an amazing day in port at St. Thomas! Be sure to check out our blog articles on the cruise ports, Havensight and Crown Bay, and visit our Shore Excursions page to book the best shore excursions on St. Thomas! If you have any questions about the beaches in St Thomas near cruise port or any questions about the island, call or e-mail us at info@caribbaconnect.com for authentic local insight! Get the most out of your St. Thomas vacation with a local guide to the beaches. Explore the best beaches in St. Thomas with our tips and experience.